The composition of the car has changed considerably in recent years. The major reason for this is due to the fact that the concentration of ferrous metals has declined considerably as vehicle producers have opted for the lighter, more fuel efficient materials such as plastic when designing new vehicles. 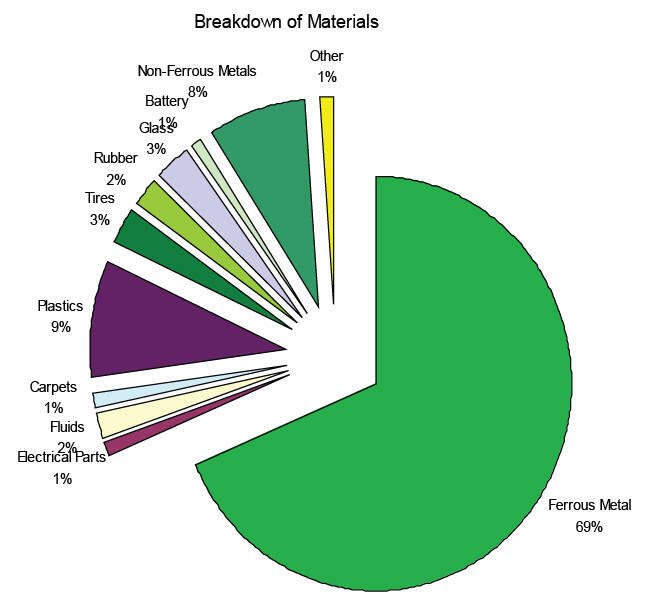 The following graph shows the average breakdown of materials found in cars in 1998. Around 76% of the average car, by weight, is made up of metal. Most of this percentage is sheet metal. The overall metal content, however, has declined in the past few decades due to the introduction of non-ferrous metals and plastics incorporated into vehicle design. Of metals used presently in vehicles, approximately 98% is recycled and recovered by shredding operations which is then developed by the steel industry and re- smelting facilities. The aluminum use in vehicles is expected to double within the next decade. As with many other sectors within the automotive industry, the aluminum industry is committed to the “sustainable management” of collecting and recycling aluminum from End Of Life Vehicles. FACT: The aluminum industry gives a continuous investment to research and development, concentrating on new ways to improve recycling procedures. FACT: The aluminum industry contributes to energy efficient recyclable vehicle designs (almost 40% lighter than traditional car designs). Aluminum can be recycled more than once and does not lose quality. Presently, 95% of aluminum from cars is recovered and recycled. Aluminum is easily separated from other materials. Due to its quality, high use and demand, there is a market for recycled aluminum, therefore, participating in the collection and recycling of aluminum keeps the market for recycled aluminum products alive. Using aluminum in its recycled form improves waste prevention measures and saves natural resources in the form of aluminum in its raw form. The Aluminum Industry actively pursues measures to increase the recycling of End Of Life Vehicles and their component parts. As stated, the percentage of plastics used in vehicle production has risen considerably in recent years. Roughly, 11% of cars today are made up of plastics. This change occurred for reasons which include the fact that they are both impact and corrosion resistant, as well as low weight and low cost. One of the most defining features of the use of plastics in vehicle production involves the fact that it is cost efficient on fuel and energy sources. FACT: A car that weighs 1.3 tons produced without plastics uses 1000 more liters of fuel in its life than a car weighing 1.1 tons produced with plastic. Therefore, the heavier the vehicle, the more fuel it consumes which is why many producers are opting for an increased plastics content in their vehicles. Although the proportion of plastics used in vehicle production has increased in recent years, the proportion of plastics recovered and recycled from End Of Life Vehicles has not. What inhibits this from occurring is the number of polymers used.  This, however, does not really present the problem, it is the fact that the type of polymers used are not stated. If all plastics were readily identified based on what polymer type used, the recyclability of plastics used would increase tremendously. 121,000 tons of plastics are currently land filled. Polypropylene (PP), Polyethylene (PE), Polyurethane (PU) and Polyvinyl chloride (PVC) are the most common plastic types used in vehicle production. 41% of plastics used come in the form of PP that is used in dashboards, bumpers, and fender liners. PP is easily recyclable as is PE and PU and markets from non-automotive areas already exist. PVC is used in 12% of the average 1990’s produced vehicle. Compared to the other polymers used in vehicle production, PVC is relatively more difficult to recycle and currently, no recycling facilities currently exist for post-consumer PVC. The traditional methods of disposing PVC involve incineration, although, in recent years, it has raised considerable concern due to dioxin emission, which is said to disrupt the hormone system. Vehicle producers are currently looking for alternatives to PVC. The inappropriate treatment of fluids is of utmost concern as far as operating fluids are concerned. Although more and more amounts of engine oil, for example, is being recovered and recycled, less than one third of waste oil is recycled by a vehicle repair person working on private vehicles. Of all vehicle-operating fluids, the one with the greatest pollution potential is lubricating oil. FACT: Waste oil from almost million oil changes in the UK is currently not collected. Had this oil been collected, it could have met the annual energy requirements of 1.5 million people. In North America, there is a well-established network of agents that facilitate the collection and recycling of catalytic converters. A similar network is also developing in Europe. The steel from the exhaust and precious metals (platinum, rhodium, palladium) from the catalytic converter can be obtained when the catalytic converter is replaced. The rate of recyclability of batteries is expected to exceed 90%, as there already exists a well-established network for the recovery and recyclability of batteries. However, there are a small percentage of batteries that are not removed from vehicles before shredding. This requires a greater attention on the removal of batteries occurring at the time of de-pollution. Glass constitutes approximately 3% of a vehicles weight that translates into thousands of tons worth of vehicle glass that was available for recycling. There are two types of glass in the automotive industry; toughened and laminated. Toughened glass is relatively easy to remove from vehicles, laminated glass, on the other hand, needs to be removed manually, which is time consuming. Therefore many auto recyclers do not remove glass due to its lack of cost-efficiency. Tire derived fuel: replaces some of the fossil fuels traditionally used. Granulation/Crumbing: processed into rubber shred/crumb for carpet underlay, sports surfaces, etc. Pyrolysis: thermally breaks down tires into gas, oil, carbon black and steel.